Hello, awesome Visible Women! I don’t know if our area will have power as you read this, but here we are nonetheless. I didn’t want to miss a Visible Monday, one that I am calling Survival Monday, after Hurricane Matthew swept in and out. Here’s an old pic, pulled from the archives, from a day when the seas and winds were calm. And we will get there again! Hey Patti. Glad to know you’re ok up your way. Did you get hit hard up there? Passed by your area on Thursday on my way back home from NE. Got home just in time to put up shutters. We lost power for one day, lost some pool cage screens and have a big yard mess to clean up. But I’ll take that anyday over what some others have had to deal with. Phew! I’m so happy to hear that you and yours are safe, Patti. So glad you’re safe and that the hurricane wasn’t quite as scary as the news made it out to be! Thanks for hosting as always! So glad you made it to the other side! You look so lovely and relaxed in this pretty white dress. I’m so glad you’re safe. Wishing you a speedy return to calm seas and blue skies. I am so glad you are alright. And that you found diner too. You survived!! What an ordeal! And still you hold Visible Monday. !!! You amaze. Thanks, Patti. Glad to know that you are okay :)! Stay safe and have a great week!!! Beautiful photo, and yes you will be there again! I am happy to hear that you made it through safe, and my thoughts are with those who did not fare so well. Oh, Patti…so glad you’re OK. Thinking about you. Thanks for hosting under stress! I’m so grateful that you’re okay, Patti! Glad for your safety and enjoy your beach pic. Praying for all with Hurricane Matthew. So happy you made it through the other side unscathed. You look fresh and crisp in white. Glad you are safe from hurricane Matthew, Patti. What a gorgeous, calm and serene photo of you. I love you in white! That’s a lovely photo of you. Glad the hurricane has passed and you are ok! You look divine Patti! My prayers go out to all those affected too! So glad you made it through safely my friend! It sounds from IG that you made it okay, but I can’t even begin to imagine what an exhausting few days it must have been. Hope you are safe and well! Please stay safe and sound! I love that photo too! We keep a close eye on the news. So pleased all is well , thanks to IG. Hope your community is not too affected and will return to normal soon. Lovely photo of you when the weather was not so fierce. I know from IG that you and yours are ok and I was glad to see that message. Thanks for planning ahead and hosting despite the difficulties. So glad you are safe, Patti…and you have returned to your beautiful Florida. Thanks for the linkup. I’m glad you made it safe through the storm. I am sure it was an ordeal and a lot of folks have work ahead of them getting life back to normal. My thoughts go out to all. The picture of you on the beach is just lovely…! Gosh Patti—we’re definitely praying for you and everyone you know. Mother Nature sure can put a kink in our plans, but as long as you’re safe, that’s the important part! Glad to know you’re OK. I hope there’s not too much cleaning up to do. 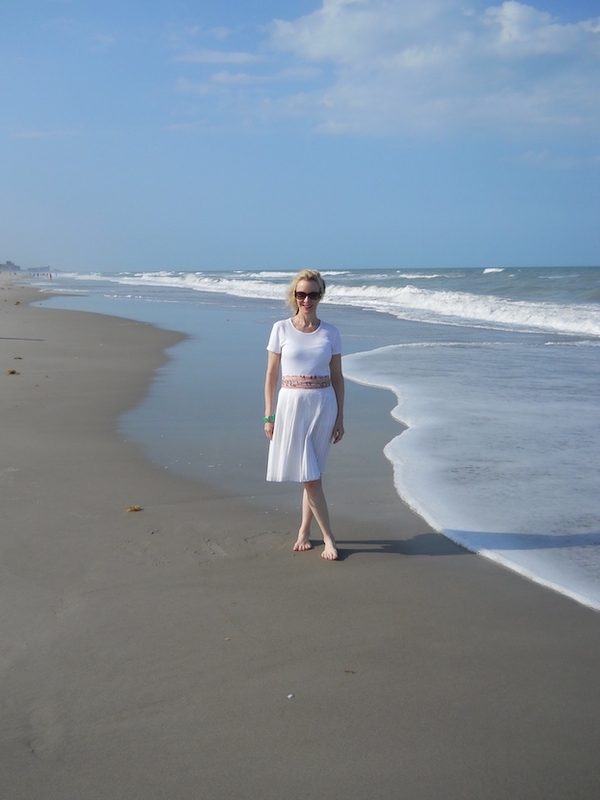 Beautiful on a sunny beach day in white and I know you are beautiful hunkered down recovering as well. Hope all is ok and all those you love are ok too! !